During England's eventually successful chase of 306 to beat Bangladesh in the opening game of the Champions Trophy, Alex Hales was on his way to a hundred. He'd just started to take a fancy to the bowling of Sabbir Rahman and biffed a couple of boundaries to move to 94. Swinging for the fence once more he was caught at deep midwicket. 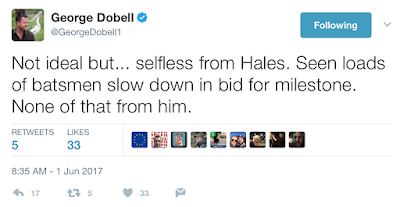 Dobell is suggesting - and for what its worth I broadly agree- that whatever you think of the selection and execution of the shot, Hales' attitude was admirable. Rather than play steadily through the 90s to try and guarantee himself the milestone and associated plaudits, he judged that it was better for the team if he carried on accelerating, and was willing to risk the personal achievement of notching another ODI hundred for the good of the team. 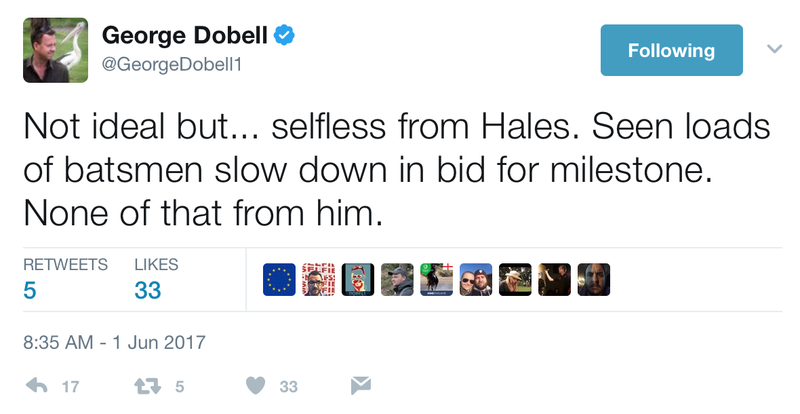 The tweet also seems to allude to a converse attitude among many of Hales' peers- that many of them do slow down as they approach 100, for the sake of trying to make sure of getting there. In today's blogpost I want to examine that idea amongst modern ODI batsmen. Is it really common for ODI batsmen to noticeably slow down as they approach 100? If so, how much do they slow down? How much innings momentum is lost to milestone hunting? In an attempt to answer these questions I have had a look at the ball by ball data for all of the ODI centuries scored between the beginning of 2016 and the England v Bangladesh match the other day (so the data doesn't include Kane Williamson and Hashim Amla's centuries in the last two days). This adds up to 108 centuries. I divided them each up into windows of 10 runs (0-9; 10-19 etc) and asked how many balls each batsman spent with their score in each window. If batsmen are tending to slow down as they approach 100, we should see that they spend more balls in the nineties than in the 70s or 80s. The graph below show the average result for each run window, averaged over the 108 centuries in the sample. 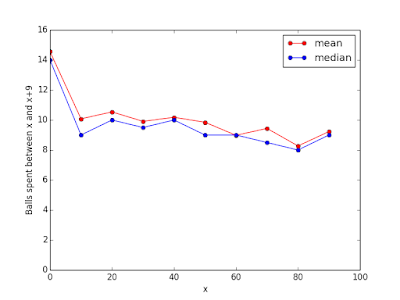 The red line is the mean, the blue line is the median. One feature of the graph which I like- which is basically irrelevant to today's question but I'll mention it all the same- is that does give a nice visualisation of the batsmen playing themselves in. 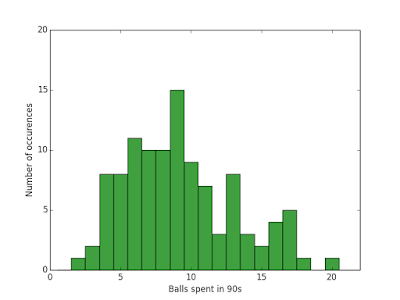 The first 10 runs really are noticeably slow compared to the rest of the innings, taking an average of around 14 balls. Thereafter, the average ODI centurion stays close to the run a ball mark, with gentle acceleration over the course of the innings. The average number of balls taken to get through a 10 run window goes from 10.09 in the twenties down to 8.27 in the 80s. The brakes do seem to go on just a little bit in the 90s however, with the average balls taken for those 10 runs ticking back up to 9.23. (The median goes up to 9 from 8). So, the data is a consistent with a weak slowing down as batsmen get near the milestone. But its a very tiny effect. Indeed the size of the effect is comparable to the degree of statistical noise in the data, so I'm not even 100% sure its real. But, if we take it at face value, batsmen are on average spending about 1 ball longer in the 90s than they are in the 80s, possibly influenced by the impending glory of an ODI hundred. To look at the data a different way: 56% of the centurions were slower through 90s than they were through the 80s. By way of comparison only 38% were slower through the 80s than the 70s. Again this is consistent with the expected steady acceleration through the innings, which is very slightly waylaid by a nervous nineties slowdown. 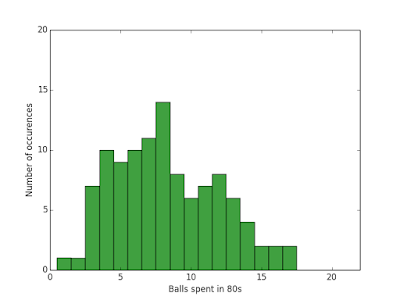 The distributions for the number of balls taken to get through the 80s and the 90s are plotted below as histograms. 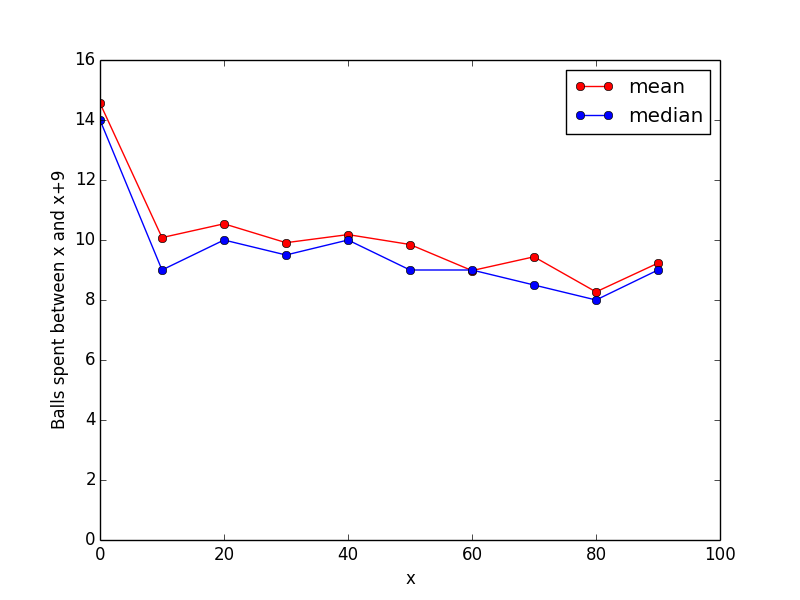 Comparing them you can see a slight rightward shift of the distribution as you go from 80s to 90s. An extra one ball to score 10 runs is very small potatoes, so you probably don't need to be too worried that this is going to cost your team a match. Of course, for some individuals the effect may be stronger. And still, its interesting to reflect that even the top pros may be affected by the arbitrary milestones made for them, even if just by a tiny bit.